The Constitution Building, located at the northwest corner of Alabama and Forsyth Streets, is also referred to as the Georgia Power Atlanta Division Building. The site is further known as the "Heart of Atlanta" because of its location at downtown Atlanta's historic railroad junction. This masonry building is a rare example of Art Moderne in Atlanta. 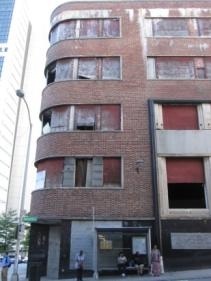 It was constructed for the Atlanta Constitution newspaper which occupied the building until 1953. Georgia Power completed a remodel and moved into the building in 1955. Many Atlantans paid their electric bills at this downtown location. Along the Forsyth Street side was a bas-relief sculpture depicting the History of the Press by Atlanta artists Julian Harris; it is now installed in the Georgia World Congress Center MARTA station. An aluminum and terrazzo medallion depicting the state seal of Georgia was imbedded in the floor of the entrance and is currently on display in the entrance of McElreath Hall at the Atlanta History Center. On July 14, 2010, the Georgia Department of Transportation announced its plans to hire a developer to transform the “Gulch” area near CNN Center and Phillips Arena. Any development plans may include the demolition of the Constitution Building which abuts the parking lots that surround the active downtown rail hub. Requests for Proposals were distributed in 2010 with the master developer, Cousins Properties, announced in September 2011. Structural analysis has determined the building is basically sound. A fire on March 25, 2013 caused further damage to the building, the extent and effect of which are not known. A survey in 2012 by the State Office of Historic Preservation found the building to be eligible for nomination to the National Register.